So I’m sitting in the Denver airport right now with a 5 hour layover. I totally intended on sharing this delicious recipe with you guys on Monday buuuut my computer wouldn’t connect to the wifi at the house we were staying at in San Diego so it didn’t happen. If we hadn’t have had two big trips within a couple weeks of each other I would have had it written ahead of time. I know, excuses, excuses. If you have been reading for awhile, you already know I love everything about the 4th of July. Fireworks, grilling with family and friends and of course celebrating this amazing country we are lucky to live in. I’m also a sucker for a themed dessert so naturally I pull out all the stops when it comes to the 4th. Cheesecake stuffed strawberries, tie-dyed cupcakes, patriotic pudding pops and even rice krispies have been given the red, white and blue treatment around here. And today I’m sharing a new favorite, 4th of July poke cake. This cake starts off with a regular white cake mix, baked according to package directions. If you have a white cake recipe you love, you could absolutely substitute that instead. I’ll even give you a pat on the back. Be careful not to overbake the cake as this recipe won’t be totally drenched in liquid like a lot of poke cake recipes. 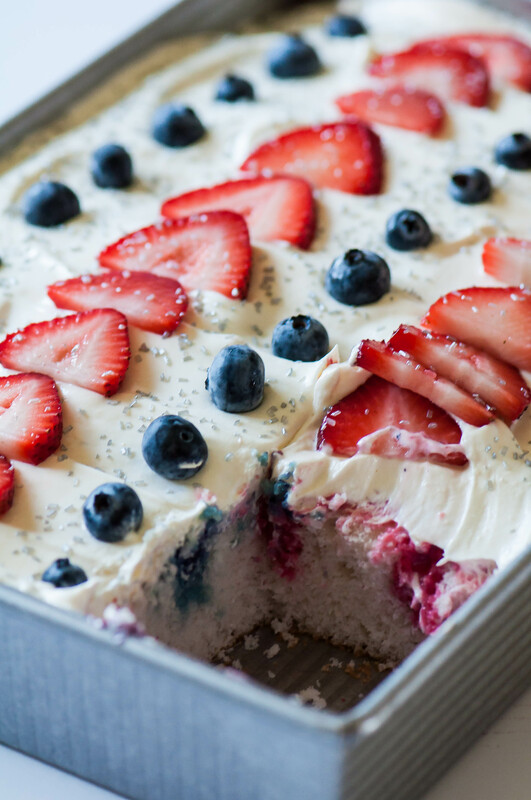 What makes this 4th of July Poke Cake even better is it gets its red and blue naturally from strawberries (or raspberries or cherries or whatever red fruit floats your boat) and blueberries. You can add food coloring to make the colors more vibrant but I think the fruit totally translates the festive spirit on its own. Because we use pureed fruit along with the sweetened condensed milk it gives it a yummy boost of fruity flavor along with the fun colors. And let me tell you about the frosting. It’s only three ingredients (cool whip, pudding mix and milk) and pure heaven. I don’t usually like frosting all that much because it’s so sugary but this is a whipped frosting so it’s not sickeningly sweet. You will probably want to eat it by the spoonful. I won’t judge. I did it too. This 4th of July Poke Cake is best when made the night before so it has time to chill and soak up all the liquid goodness. If you don’t plan ahead though, don’t fret, a few hours will do the trick too. I striped the colors to make a flag-like pattern but do whatever suits your fancy. This is a fun recipe to make with the kids since poking (aka destroying) a cake feels like they are breaking the rules and they will totally love it. Making patterns with the liquid and fruit on top is also a fun way to get them involved. Oh, and sprinkles. I’ve never met a kid who didn’t enjoy dousing something with sprinkles. Or adult for that matter. Bake cake according to package directions. While the cake is baking, pour half the sweetened condensed milk (1/2 cup), frozen blueberries and blue food coloring, if using, into a blender and blend until smooth. Pour into a squeeze bottle or a jar with a narrow opening. Rinse the blender and pour the remaining sweetened condensed milk, strawberries and red food coloring, if using, in the blender and blend until smooth. Pour into another squeeze bottle or jar. Set aside while cake finishes baking. Allow cake to cool for 5 minutes then poke holes using a skewer or the end of a wooden spoon, in rows. Pour the prepared berry mixtures in rows (widthwise), alternating to make a red and blue pattern. I made each row about an inch wide. You could go narrower or wider depending on the look you wish to achieve. Cover with plastic wrap and place in the refrigerator to cool completely. Meanwhile, make the frosting. Mix together the pudding mix and milk until thickened. Gently fold in the Cool Whip. Spread over the cooled cake. Decorate with blueberries, strawberries and sprinkles. I saw that you said you puree the fruit with sweetened condensed milk but the ingredient list days evaporated milk. I’m confused as to what you’re suppose to use. Oh gosh, thanks for pointing that out. It’s supposed to be sweetened condensed milk. I’ve updated it to the correct ingredient!